I talk to dead people. Looking for guidance. Looking for answers. Sometimes on my lunch break at work, I take the Daniel Day - the Luas - up to Harcourt Street and walk to Mount Jerome cemetery in Harold's Cross for a quick chat with my parents. Some 28 years or so ago I was in the family home in Churchtown one evening to write a speech for an art exhibition I was opening the following night in town. I had a flat in town but I was spending more time at home than I was in my so-called new lodgings. I was a hopeless case. I would throw out clothes and buy new ones rather than wash them. I couldn't cook. I had long hair down to my waist. I was drinking too much. Tumblers of brandy in the Shelbourne with Jonathan Philbin Bowman. I was two stone overweight. I hadn't a penny in the bank. And I was spending money like it was going out of fashion. Not my money, of course. I was borrowing money from my dad without telling my mother. And I was borrowing money from my mother without telling my dad. I was stressed out of my mind while trying to pretend to the world that I wasn't stressed out of my mind. You can hide a lot behind a byline picture in the Sindo when you're in your early 20s. So, back to that night in Churchtown. I was in the sitting room quietly writing the speech on my computer. So quietly, in fact, that my parents didn't know I was there at all. (In many senses, in my 20s, like a lot of young men, I wasn't there at all.) In the other room, through the din of my mother's favourite show Coronation Street on the telly, I could hear my parents talking. About me. The choicer excerpts of which included: "He's losing his fecking mind." "He's stressed out of his mind." "He's going to give himself a stroke." "He's going to have a heart attack." "Is he ever going to give up rent here?" "I don't know why we spent all that money on him to go to De La Salle Preparatory School. He looks like a fecking hobo with that ridiculous hair of his." "Can you talk to him about a haircut?" "He doesn't listen to me." "He doesn't listen to me either." "He doesn't listen to anyone." "He needs to have his head examined." "He's too bloody young to drink brandy!" "He'll be dead by 40 if he keeps drinking brandy!" "I've never seen him so unhappy in his entire life." "This is the happiest day of my entire life," I opened my speech the following night, with my smiling parents looking on, possibly bemused but keeping it to themselves, "to open this fabulous exhibition..."
It was a few years until my parents' words finally sank in and I copped myself on. I miss them. There is not a day that goes by when I don't think about them. I wish they were around so I could have a proper chat with them now. I will have to make do with the grave until I met them again; maybe in some other place above the clouds, or thereabouts, where my dad can make jokes about him getting me an estimate to get my bloody hair cut. I was up before dawn last Monday to catch a 7.30am flight to London. I was to meet a well-known pop star for lunch at noon and then fly home on the 5pm flight. The well-known pop star was to give me an interview that you were supposed to read in today's Sunday Independent. That was the plan. The plan, however, soon lay in ruins at Dublin Airport. At 6.45am we were told that our 7.30am flight was being rescheduled until 4.40pm that day. As you can imagine there were lots of irate passengers. We were offered apologies and food vouchers for our 10-hour wait. It was a bit Monty Pythonesque. If I'd taken the 4.40pm flight, I would have crossed myself in the sky as my return flight from London was leaving at 5pm. The well-known pop star wasn't able to reschedule our meeting until tomorrow at the same place and the same time in London. So tomorrow morning I will be up at 5am once more on a Monday morning to catch a flight I hope won't be changed until after I am supposed to be flying back from my intended destination at. Otherwise I am going to write to Michael O'Leary to beg him to please make a bid for this airline. Michael always writes back to me - unlike the customer care people at this airline, which I emailed very politely last Monday at 7.15am. 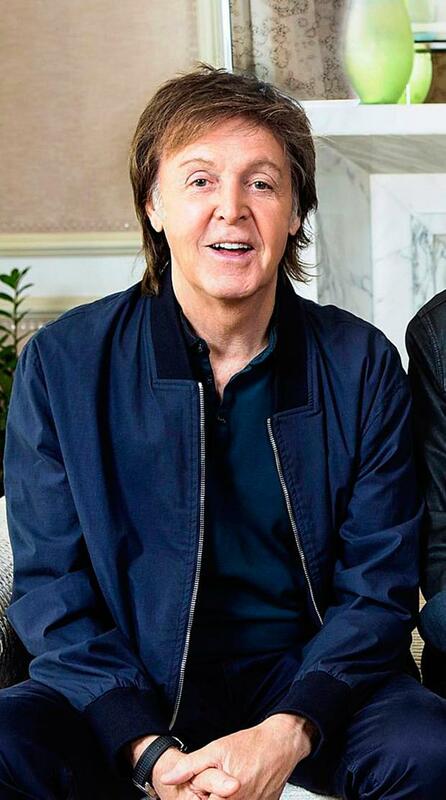 Paul McCartney is back touring. Great news. I hope he comes to Ireland. I will never forget meeting him in Munich in 2003. Primarily because the author of such tender classics as Let It Be, Hey Jude and Yesterday told me the following unforgettable joke. "This guy walks into a pub," Macca begins. "'I'll buy it off you,' the man tells the barman and goes home to his wife. "'It's a ferret. I've just bought it,' he says. "'What do you me want me to do with that?' she asks. "'Teach it to cook and f**k off.'"